Whether you are an experienced cyclist or new to riding, the training you do in the months leading up to the Victory Ride will make Ride Day more enjoyable. The more prepared you are, the more likely you will cross the finish line with a smile on your face. Your Training Guide includes information about safety, nutrition and staying injury-free. We also provide training programs with recommendations for how far and how often you should be riding. Note: Programs in the Victory Ride Training Guide are meant to be used as guidelines. Before you begin any endurance training program, consult with your doctor to discuss your current physical condition and any potential risks or limitations. Group rides are fun! Check out the Events Calendar for group rides that may be happening in your area. 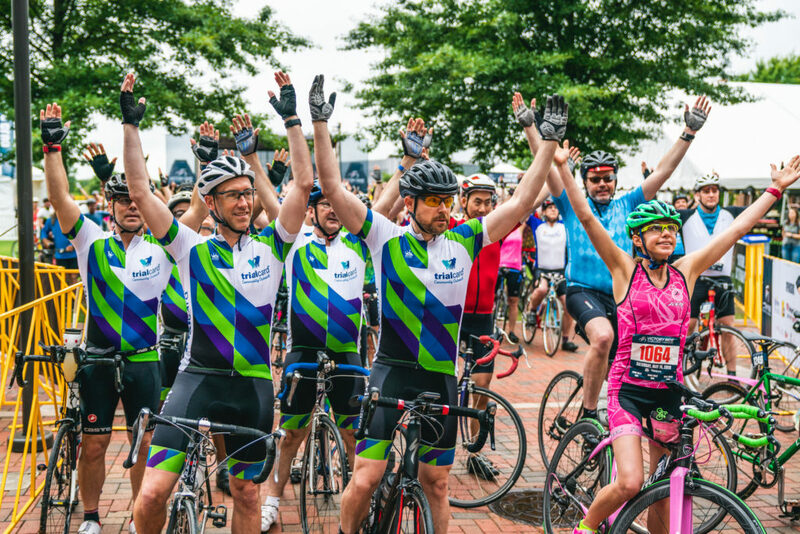 If you do not live close enough to participate in our rides, connect with a local cycling group in your area. Fellow riders provide company on your long rides and maybe you will even make new cycling friends who will want to join you for the Victory Ride. We would be happy to help you start a team! Your safety is important! The Victory Ride staff and volunteers will create a safe route and cycling environment. To ensure your own safety and the safety of your fellow cyclists, please adhere to the following safety guidelines. Always wear a helmet when riding your bike — helmets are required at the Victory Ride. Obey all instructions from law enforcement and Victory Ride staff and volunteers. Wear brightly-colored clothing and/or a reflective safety vest. Ride with traffic on the right side of the road. Leave one bike length between you and the rider in front of you. Pass on the left and only when it is safe to do so. Use hand cues to point out potential hazards in the road, like potholes and debris. Never assume that a driver or another cyclist sees you — ride defensively. Never wear headphones while cycling. If you need to take or make a phone call, stop riding and pull over to the side of the road where you are out of the way of other riders and drivers. Always be courteous and respectful of other riders and the general public. We will send additional on-event safety rules and regulations to all participants via email prior to event day. Thank you for helping us make safety a priority!